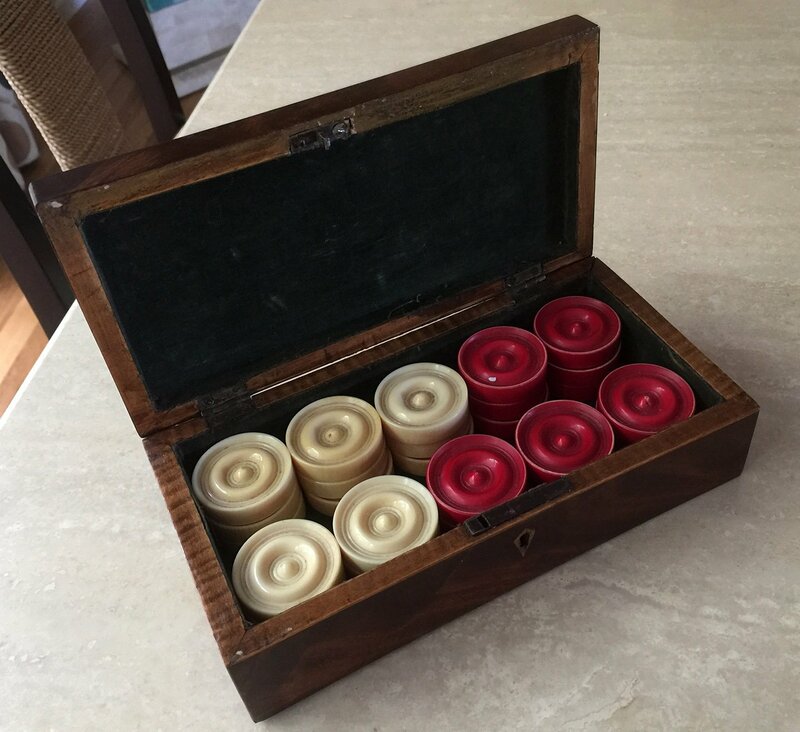 This offering is a complete set of 30 large English Antique ivory Backgammon Pieces, red stained (Cochineal) and natural. 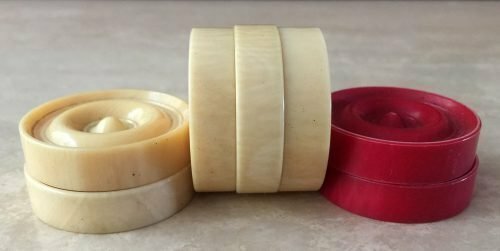 The individual checkers measure 1.45″ in diameter by 3/8″ thick. These English-made Backgammon checkers date to around 1890. 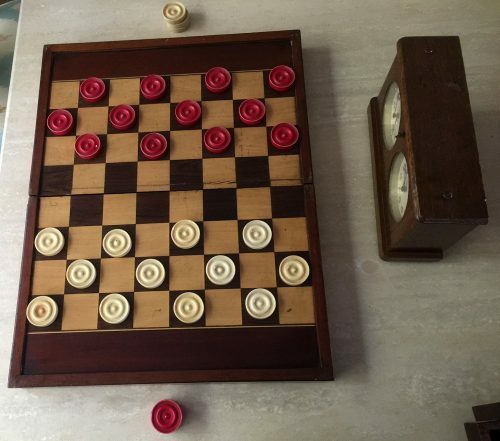 The antique folding chessboard shown is not included, but this and several other suitable boards are available elsewhere on this web site or upon request. The ivory Backgammon stones are in excellent condition with no repairs or replacements. 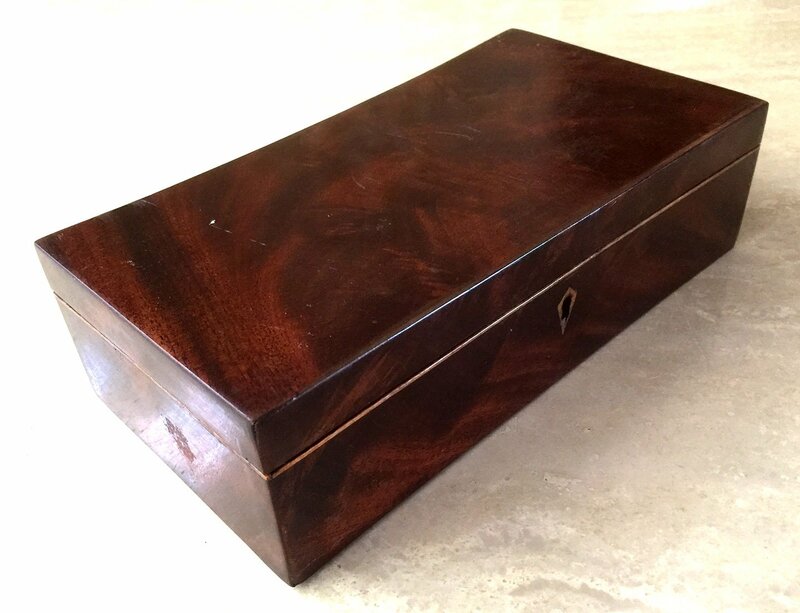 The set comes housed in a lovely hinged Coromandel veneered box with a semi-mortise lock set. This set does not include dice, shakers or a doubling cube. 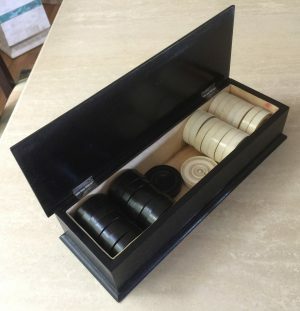 These 30 Backgammon counters can also be used for several other board games. Cochineal Dye. To create the red dye, Carminic acid is extracted from the female cochineal insects and is treated to produce carmine, which can yield shades of red such as crimson and scarlet. The body of the insect is 19–22% carminic acid. The insects are processed by immersion in hot water or exposure to sunlight, steam, or the heat of an oven. Each method produces a different color that results in the varied appearance of commercial cochineal. It takes about 80,000 to 100,000 insects to make one kilogram of cochineal dye.